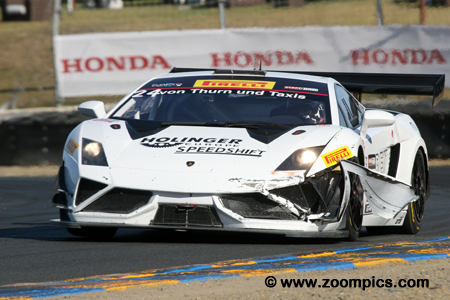 Sonoma was the second last race weekend of the 2014 season for the GT classes and many of the Driver and Manufacturer titles were yet to be decided. Race morning, the area suffered a 6.1-magnitude earthquake. But the 2.385-mile, 12-turn facility was not damaged and the events took place as scheduled. 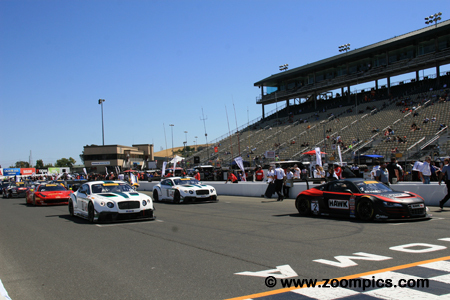 Saturday afternoon and forty-three GT and GTS competitors sit on the grid waiting for the start of round thirteen. 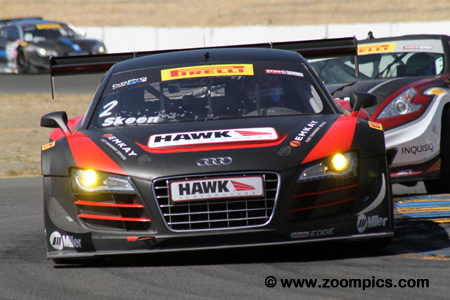 On the pole is Mike Skeen driving the Hawk Performance Audi R8 Ultra. Starting second and third on the grid are the Bentley Continentals of teammates Butch Leitzinger and Guy Smith. 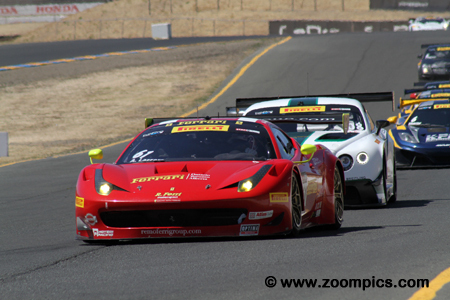 Fourth-fastest qualifier was the Remo Ferri Motorsports Ferrari 458 GT3 Italia driven by Anthony Lazzaro. Round thirteen was a near perfect race for Mike Skeen. Skeen started from the pole position and led flag to flag to win by 4.110-seconds. The only stat he did could not lay claim to was the fastest race lap. The win was Skeen’s third of the 2014 season. During Sunday’s event, Skeen got locked in a battle for fourth with Johnny O’Connell. On lap-21, he got a flat tire and pitted which dropped him to a nineteenth place finish. Lawson Aschenbach was the second fastest GTS qualifier in round thirteen. 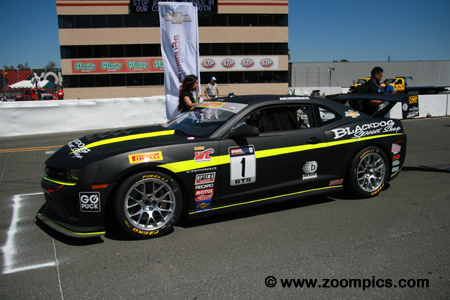 The driver of the Blackdog Speed Shop Chevrolet Camaro held this position during the race and finished 1.956-seconds behind the class winner Jack Baldwin. The following day Aschenbach jumped into the class lead after GTS pole-sitter Jack Baldwin was delayed by a stalled GT competitor. 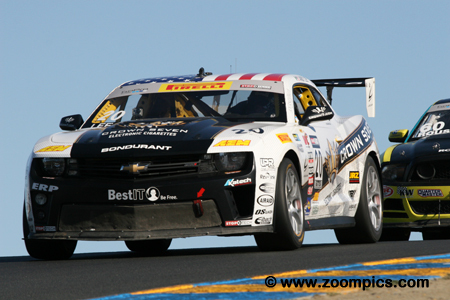 The Chevy driver was able to hold off a hard-charging Baldwin and won the GTS category by 1.471-seconds. GT category point’s leader Johnny O’Connell qualified tenth for Saturday’s event. During the race, O’Connell moved up the order and was fifth at the checkered flag – which was the most positions gained in the GT class. In round fourteen, O’Connell battled with the previous day’s winner Mike Skeen. The two fought for position until lap-21 when Skeen pitted with a flat tire. O’Connell finished eighth and retained his lead in the driver’s championship. The No. 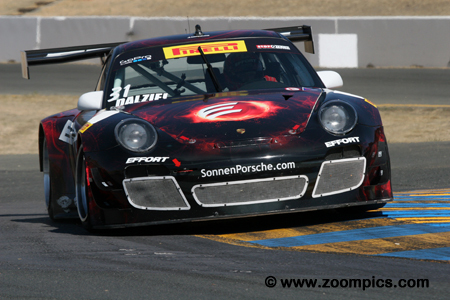 31 Effort Racing Porsche GT3R was driven by Ryan Dalziel. Dalziel started from the sixth grid position in round thirteen. He made an excellent start and by the end of the first lap was in second place. Despite pressure from Butch Leitzinger, Dalziel held on to finish second. The following day Dalziel repeated his performance – starting in sixth and taking the runner-up spot at the checkered flag. 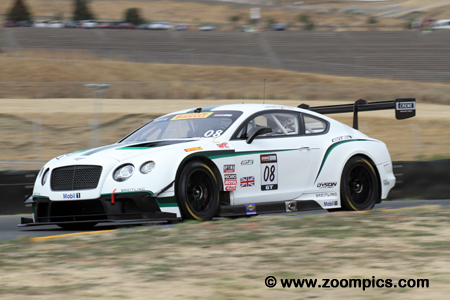 Butch Leitzinger drove one of two Bentley Continental GT3s entered by Bentley and maintained by Dyson Racing. In the weekend’s first event Leitzinger qualified second but was passed at the start. He ran in fourth place until lap-7 when he passed Anthony Lazzaro. Leitzinger held the position and earned the final spot on the podium. A poor start on Sunday forced Leitzinger to work his way through the field and by the end of the race he had moved up to fifth. Ryan Dalziel’s teammate was Michael Mills who competed in the GTA division for sportsman drivers. Mills qualified fourteen overall and second in class for round thirteen. He dropped to eighth at the start but moved up the race order and with the demise of the class leader, Albert von Thurn und Taxis, took the category victory. 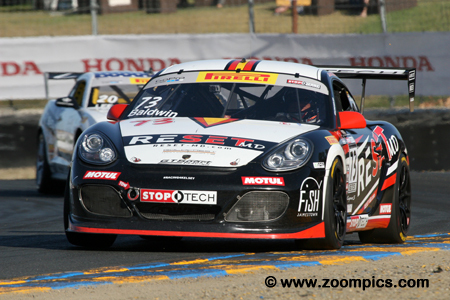 On Sunday, Mills finished twelfth overall and fourth in class – he left Sonoma with the points lead still intact. Saturday’s GTS podium. 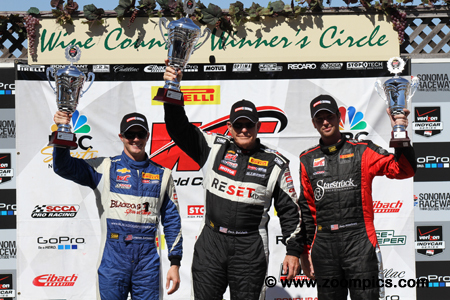 In the center is Jack Baldwin who piloted the RESET-MD Porsche Cayman S to the class victory. To Baldwin’s right is second place finisher Lawson Aschenbach who kept the pressure on Baldwin but was unable to pass. The final spot on the podium belonged to Joey Atterbury. 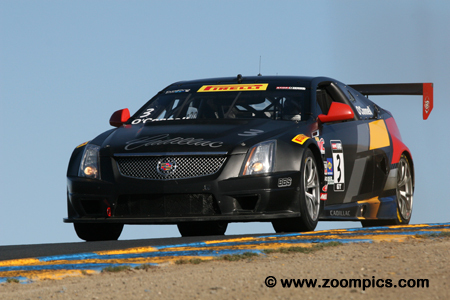 This was Atterbury’s best performance of the 2014 Pirelli World Challenge season. Anthony Lazarro qualified fourth in round thirteen driving the Remo Ferri Motorsports entered Ferrari 458 GT3 Italia. At the start, Lazarro moved to third but was passed on lap-7 by Butch Leitzinger. The next circuit it was evident that something was wrong with the car and he limped back to the pits with a flat tire. Sunday proved much better for Lazarro as he took the lead on the first lap and won by 2.519-seconds. Round thirteen was a ‘clean sweep’ for Jack Baldwin. Baldwin the driver of the No. 73 Porsche Cayman S started from the GTS pole position, led every lap to take the class victory and set a new lap record in the process. In Sunday’s race, Baldwin was on the pole but he fell to fifth while avoiding a GT competitor that stalled on the starting line. During the weekend’s final event he set the fastest race lap on the way to a second place finish. 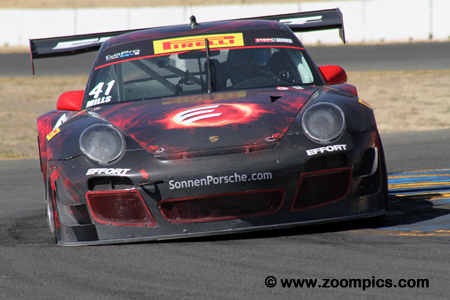 In the first event of the weekend, Andy Lee qualified thirty-first overall and seventh in the GTS group. During the race, he made some progress and finished sixth in class. Lee fared much better on Sunday. He was able to capitalize on Jack Baldwin’s misfortune and moved up nine positions on the first lap to earn the ‘Optima Batteries Best Standing Start’ award. At the checkered flag, he was third in class. Joey Atterbury was competing in his first season of Pirelli World Challenge competition. Atterbury brought a wealth of experience obtained in the Grand Am’s Continental series. 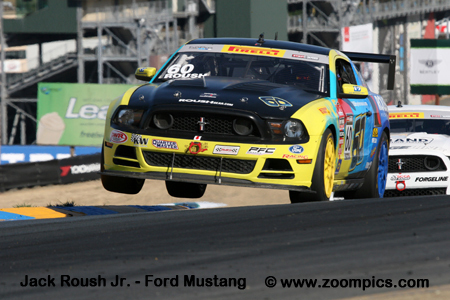 Driving the Capaldi Racing Ford Mustang Boss 302S, he finished third in Saturday’s GTS race. Gridded third in class for round fourteen he dropped a few positions during the race and finished fifth. 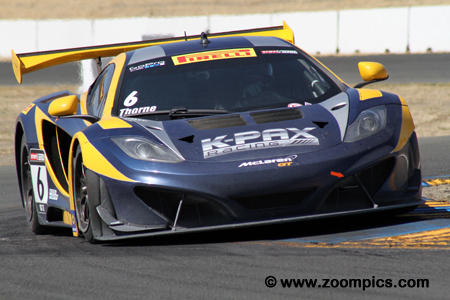 Qualifying fifth overall and in the GT category for Saturday’s race was K-PAX driver Robert Thorne. Thorne dropped down the order and finished tenth in his McLaren 12C GT3 – he had the consolation of being one of six drivers to break the previous lap record. In round fourteen, Thorne redeemed himself – he started from the third spot on the grid and remained in that position all the way to the checkered flag. 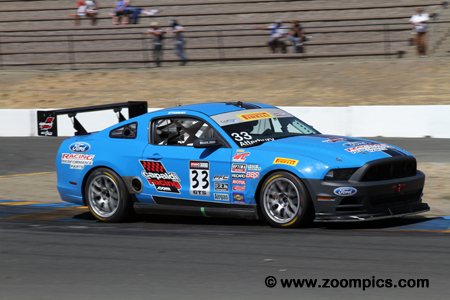 Canadian, Mark Wilkins was the GTS point’s leader entering the Sonoma event. 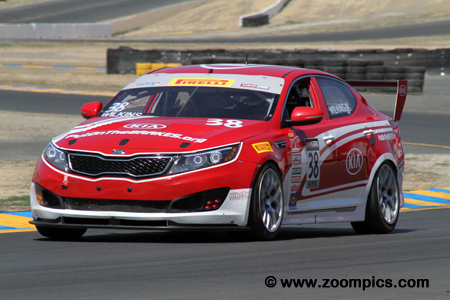 In race one, Wilkins driving the PutOnTheBrakes.org Kia Optima started third in class and finished fourth. He produced the same results in round fourteen – fourth in GTS. On the basis of consistency, he maintained the points lead but Baldwin and Aschenbach narrowed the gap. Driving the No. 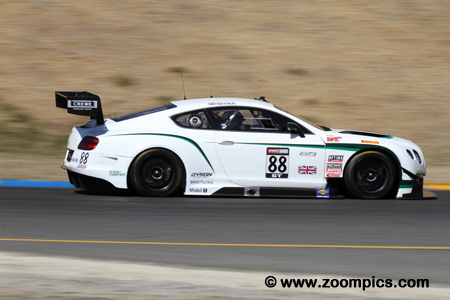 88 Bentley Continental GT3 was Guy Smith. Smith qualified third behind his teammate Butch Leitzinger for the weekend’s first event. On the first lap, Smith spun and dropped to the back of the field. He put on a charge that took him to a ninth place finish and in the process set the fastest race lap. Smith’s lap time from the previous day gave him the pole for Sunday’s race but he had a poor start and finished sixteenth. In qualifying for round thirteen, Albert von Thurn und Taxis was the quickest GTA competitor and started from the eleventh grid position. Unfortunately, von Thurn und Taxis pulled the Reiter Engineering Lamborghini Gallardo FL2 off course at corner three on lap-21 and retired. For Sunday’s event, the mechanical issues were corrected and he finished seventh overall and scored his first class victory. Saturday’s GT podium. In the center is the driver of the Hawk Performance Audi R8 Ultra and race winner Mike Skeen. 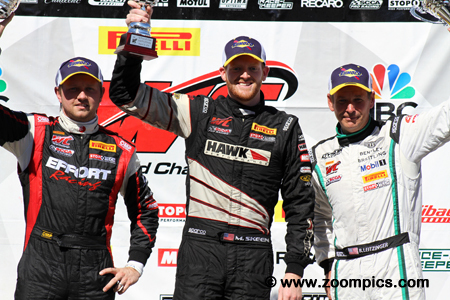 To Skeen’s right is second place finisher Ryan Dalziel earning his third podium in three 2016 Pirelli World Challenge starts. In his debut at Mid-Ohio, he scored two victories. And, rounding out the top three is Bentley competitor Butch Leitzinger.